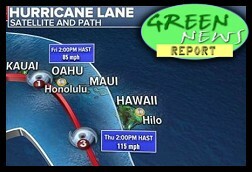 " 'Green News Report' - August 23, 2018	"
Dangerous Category 4 Hurricane Lane is pushing ever closer to the Hawaiian Islands and has already begun unloading excessive amounts of rainfall on the Big Island. Water from both torrential rainfall, exceeding 30 inches in some places, and battering waves, up to 25 feet on the south side of the islands, are likely to pose the biggest threat. In announcing the mileage proposal earlier this month, officials with the EPA and Department of Transportation contended the mileage freeze would save about 1,000 lives a year. But in a June email, senior EPA staffers told the Office of Management and Budget — the White House office charged with evaluating regulatory changes — that it would slightly increase highway deaths, by 17 annually. The ruling is likely to be appealed, and it does not apply in 24 other states where legal actions are still pending. But the groups called it a significant victory. « PREVIOUS STORY "The Stormy Fallout After Trump's Darkest Day: 'BradCast' 8/22/2018"
"'Green News Report' - August 23, 2018"
"Federal courts deliver scathing rebukes to Trump's assault on environmental protections"
Brad, you deserve extensive promotion in each and every one of the Results in the paper-ballot awareness Movement which could in only teeny-tiny scarce almost-invisible manner ever be attributed to you, but you rock it. And thanks for linking to Jenny's article. She's doing a fantastic job and I couldn't be happier she is doing so, since I'm doing all I can just to keep up with everything on the radio every day! Some change takes very little heat increase "down under" the covers (Antarctica 2.0 - 7).